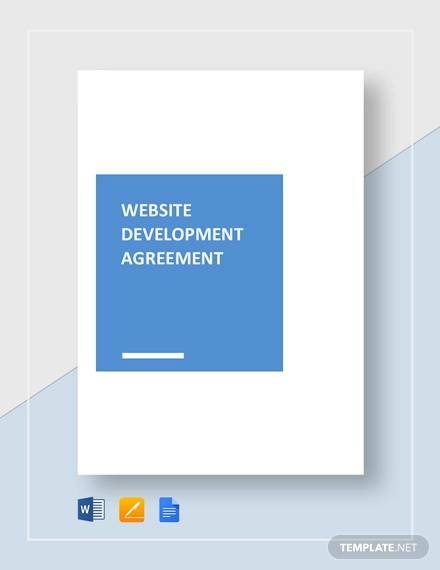 Website development agreement samples are legal documents that a client and a website development company signs before they could initiate the development process of the website. It protects the client and further clearly states the requirements of the client which the company needs to fulfill before the final release of the payment. It prevents the clients from any wrongdoings by the company such as leaking personal data or leaving backdoors for attackers. 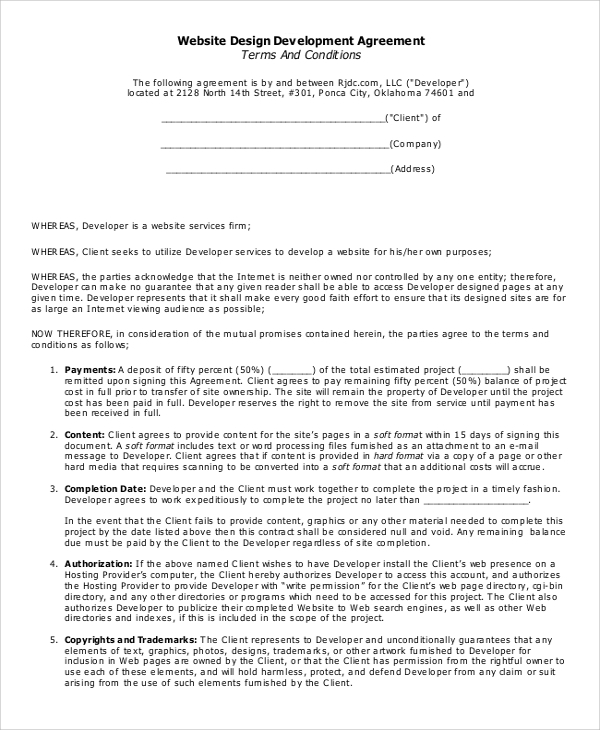 On the other hand, it makes sure that the company gets their due payments in due time.You can also see Software Development Agreement . 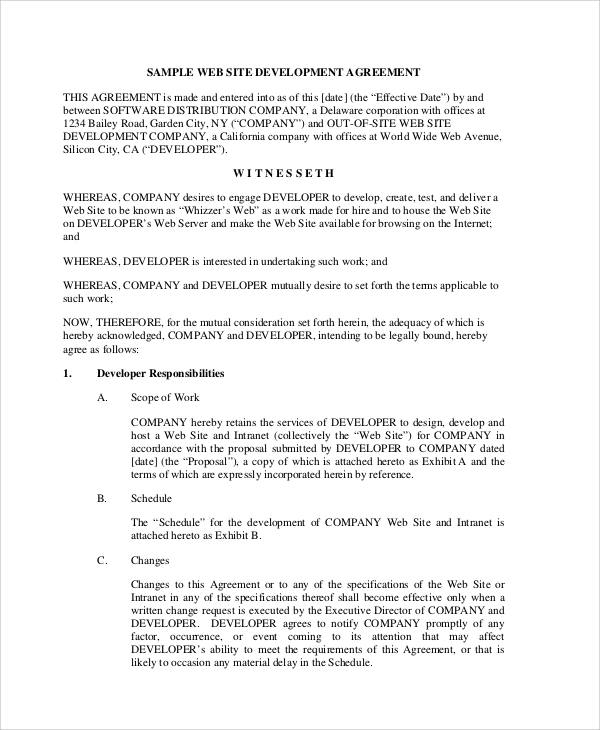 This is a legal and formal contract agreement between the website development company and the client who has provided the project. It contains all the terms and conditions with clauses such as the timeline of the project, process of development, copyright, ownership, cancellation, amendments, legal consequences during a breach of contract, technical support in future and estimated cost etc. It is helpful for both the client as well as the company to protect themselves and their resources. 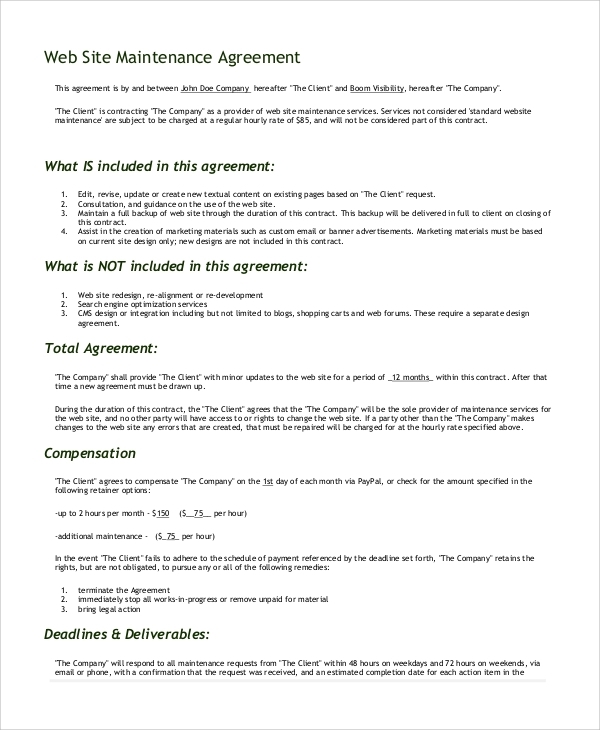 This is a complete legal document for contract signing between the client and the service providing company. It clearly states what the service is, how much it costs, the process and timeline of the service, termination clauses, confidentiality, future support, applicable laws, and consequences if flaws are found in future and the validity of the contract. It prevents the client for any misuse of this website in future through the loopholes if any. 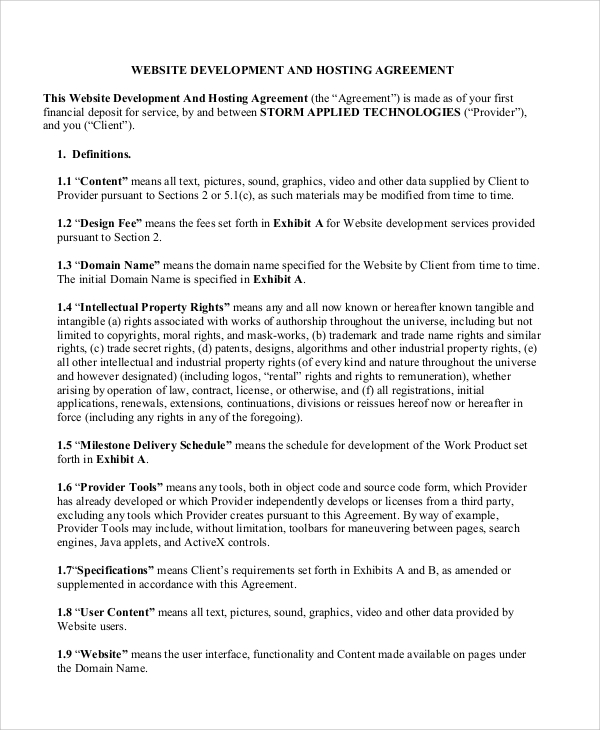 This is a confidential agreement document that a client and a website development company must sign to protect themselves before they can begin working. It clearly states the timeline of the project, confidential information, the laws pertaining to breach of agreement terms, details about intellectual property rights, the process of development and the illustrations, license agreements, future support and much more. 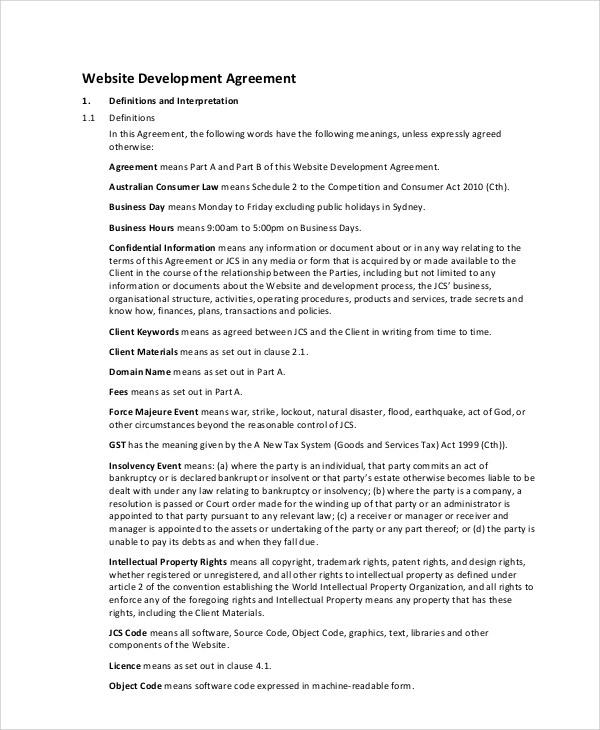 This is a completely editable agreement form for website development. It contains the description of service, payment and working process in details. It also states what the client wants so that a company does not have to work more than the contract to satisfy the client. It states the intellectual property rights, warranties, and other miscellaneous clauses that protect both of them from fraudulent practices. 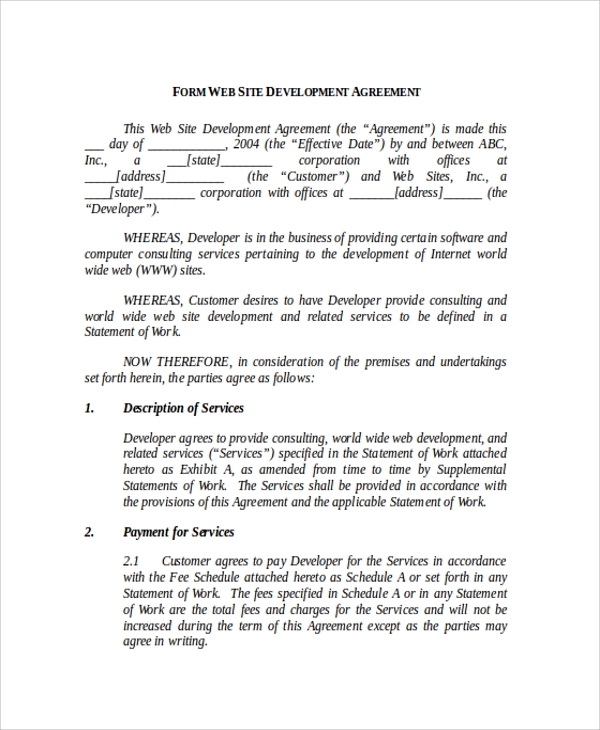 Website development agreement is a legal contract that protects both the client and the company in equal measure. From a client’s perspective, it helps him to achieve his objectives and get what he wants as per the specifications and objectives mentioned in the agreement. It ensures that he can get technical support in future and makes the company keep the personal data confidential. It has clauses against any or all malpractices from the company’s side such as leaving backdoors for hackers, willingly leaving bugs in the codes and much more. From a company’s perspective, it ensures that they work according to the requirements and fulfill them. They do not need to work more than what is specified. It makes sure that they get the payment at the right time. The targeted audience, in this case, are both the client and the company as it protects them both and helps in clearing out the terms and conditions before initiating the working process. It helps a company to approach any potential client with transparency in work and likely to get more project awarded in future from repeat clients. The clients can be assured of getting the website that they want and their money will be worth it. It protects from fraudulent cases and other online related mishaps through compensation from the company. The benefits of such contract templates are meant to get protection against any fraudulent practices, protection against the delay of payments or software installment and protection against leaking of confidential data and information. 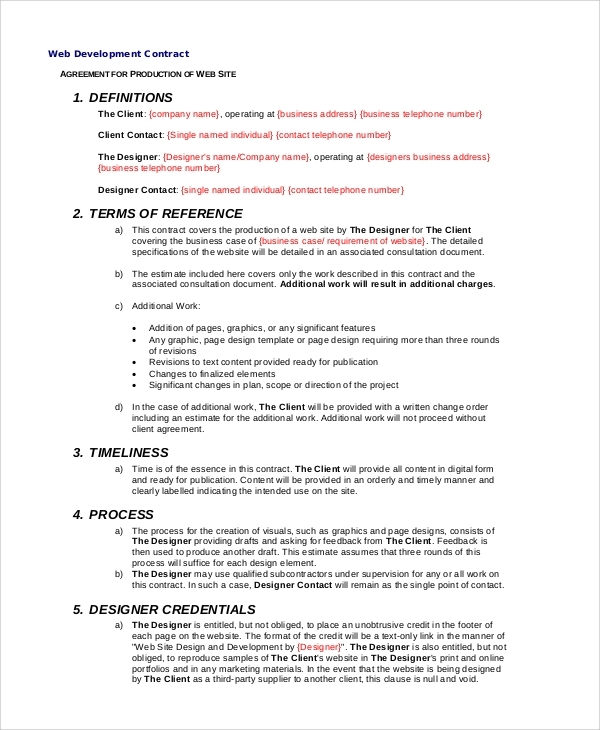 The client and the company come into terms to clarify what exactly are the requirements from the client and what the company needs to deliver. It also states the estimated price of the product or the services and confidentiality terms and intellectual property rights. It states the future support conditions and the installments of the payments from time to time depending on the release or showcasing of the software in development state. 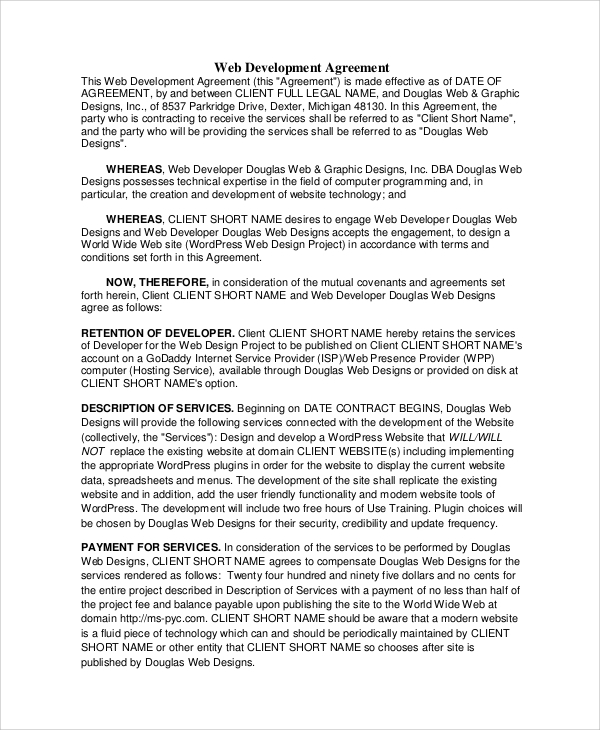 Website development agreement sample is a legal contract that takes place between a client and a website development company for a project that the client wants the company to develop. It has all the necessary clauses and sub-clauses to protect the interest of both parties. It is mandatory for small to large scale projects.You can also see Business Development Agreement.